Such a cornucopia of color! They, the colors, play well together. Rich and solid. I want to see a full army pic sometime. Thanks, Dread ! I appreciate the compliment. The robes were originally supposed to be a darkened shade of pink, but I decided to try something different. Didn't really like the pink in the scheme too much so didn't want to apply it across the entire army. Those three models are the only finished stormcast that I have so far. But I'm working on several more at the moment. 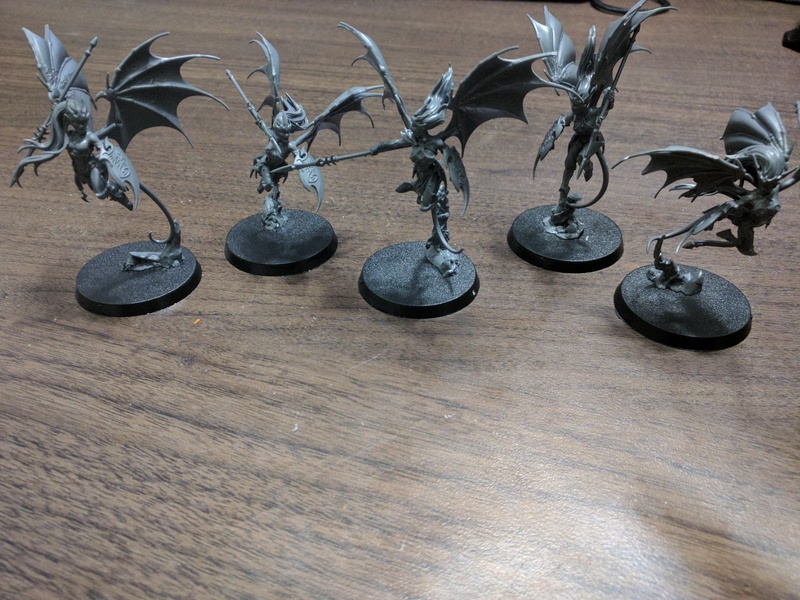 Good thing about Stormcast is that you don't have to paint a ton of models to make significant progress in painting their army. Hopefully I'll have more pics soon! Like Dread said, absolutely amazing work Myen’Tal! I love the choice of colours you used on those, and excellent paint job to boot! I look forward to seeing more! Thanks Calamity, I've actually gone back and looked at the photos and decided that I could clean some of those models up a little bit! Some of the highlights are pretty chunky and be thinned down a little. Also there's some slight mistakes on the armor too. I appreciate your compliment on them! 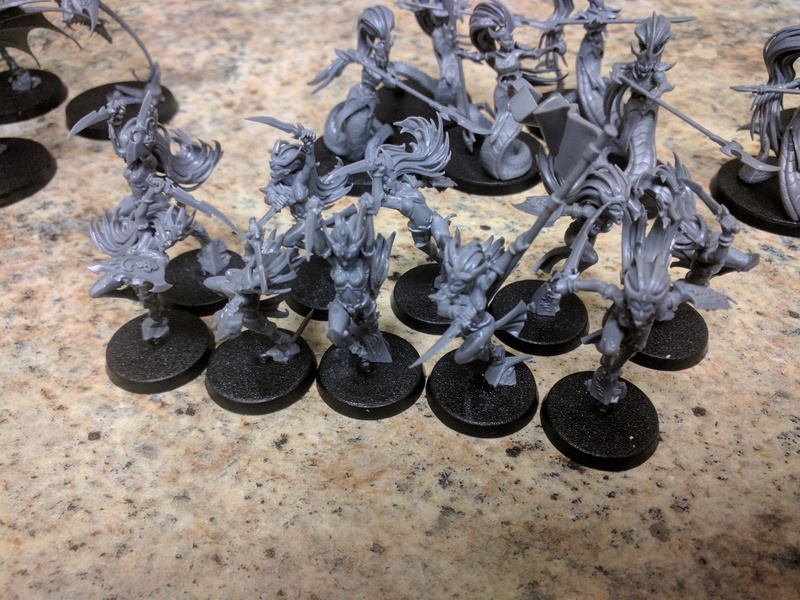 So, update: I have hereby sold my Tau Empire and Gloomspite Gitz collections! Myen'Tal, are you mad!? I here you say, but I think that this is for the best. Lately, I've been kind of rolling on the Age of Sigmar bandwagon a little too much and want to dial it back a bit, for now! I have two AoS armies that need completing already, and plus, I have a third ambition for warhammer. I've decided to sell my T'au Force, because I realized that I wanted to purchase this new Shadowspear Box Set that should be coming out soon. I was tempted by Genestealer Cult, but ultimately, they're not a faction for me. I don't want to be juggling too many armies right now, so I've sold off both armies and in return, will be able to start a new collection by buying two of the Shadowspear Boxes. Not certain if I'll keep both sides of the box, but if I do, I'm only going to be focused on one for the near future. Plus, marines, chaos and Primaris alike, probably don't have as many models to paint like my Tau list would have required . 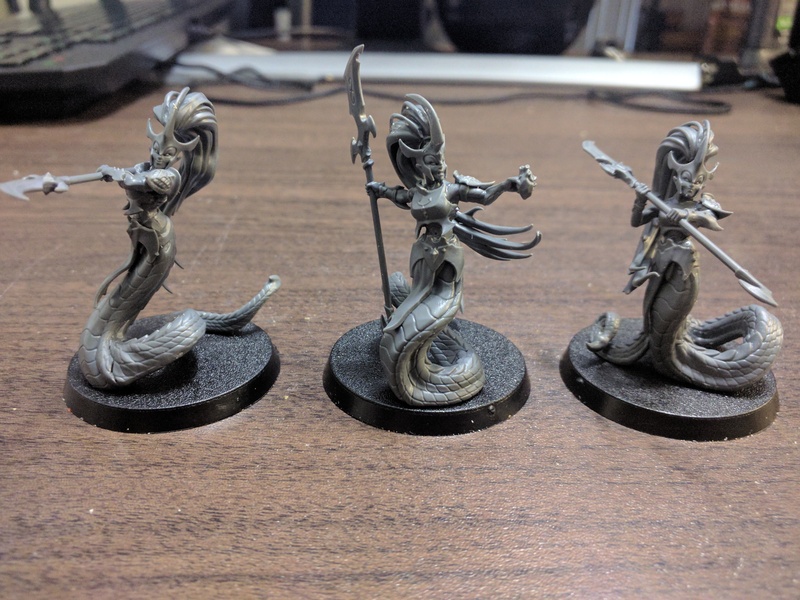 So, for right now, I'm just going to keep pressing on with my Stormcast and Deepkin. Well bummer on the Grots but I understand. I used to have more armies myself but I saw more shineys, or bills, and I regret some of them. But such is life. So now you gotta get cranking on the ones you do have. Looking forward to them! Shame to hear that you've decided to move on from the Gobbos Myen'Tal, but if you can't devote the time and energy, it's never worth it to hang onto them. As for the Stormcast, I think they look good. As you say, a few of the highlights are too thick, but the colour scheme is striking and I think they'll look good once you finish a few more of them. I’m sorry about the Grots too, but I completely understand. I’m considering doing the same for my Bloodbound. They’ve never really floated my boat the way KO and GG do. Anyway, looking forward to seeing what you do next! Thanks for the encouragements, guys, parting with the Grots was a bit of a conundrum. Buuut, I've been thinking about where I want to take my Age of Sigmar projects, and what types of armies I'd be most satisfied with painting and playing with. I also find these kinds of a factions as really great chances to experiment and learn more about painting in different ways. I never would have had the bravery to paint patterns on anything before the coming of the Idoneth, which inspired me to new heights of experimentation and uplifting my personal standard. I thought about that for a bit, and realized something quite important. Since the days of Fantasy, I've always been fascinated by Elven races and the chronicles of their nations and heroes. That hasn't changed with the arrival of the Age of Sigmar. Some of my favorite characters have gone through some weird changes. Alarielle becoming the Goddess of Ghyran, Tyrion going blind, Teclis inflicting near genocide on his first creations. Others have stayed the same, Morathi still scheming and manipulating even though she's a snake monster now, and Malerion still as enigmatic and cruel as ever. I find myself still in love with aelvendom, and I've resolved that I would like to collect each major Aelf release at some point in time. 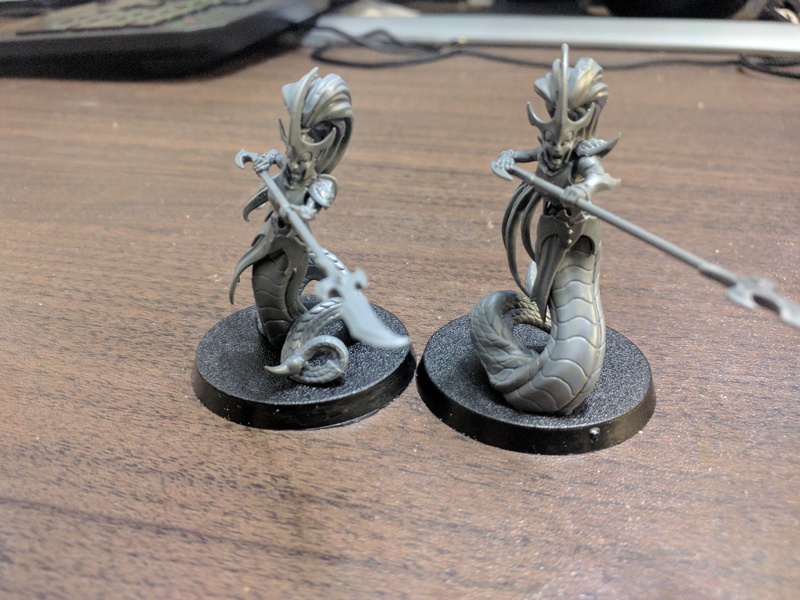 I've just about finished collecting the Idoneth Deepkin, of which I'm missing only the Leviadon and some Isharann. So that leaves: Sylvaneth and Daughters of Khaine that are available to be collected now, and Tyrion's Angelic race of Reason and Malerion's shadow aelves that will be released in the future. 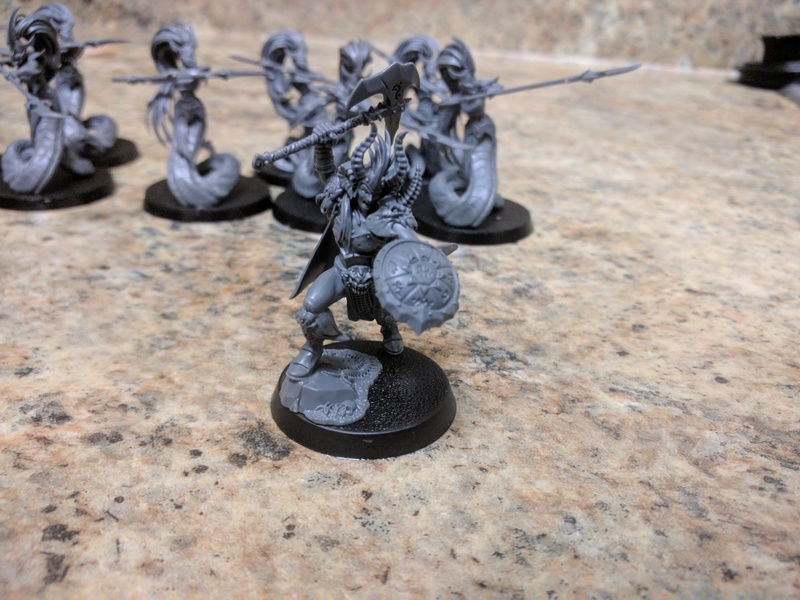 So, I'm deciding whether to redirect all of that goblin credits into Sylvaneth or Daughters of Khaine. Right now, I am leaning toward Sylvaneth and am researching some schemes for them. If you guys have any opinions, let me know! 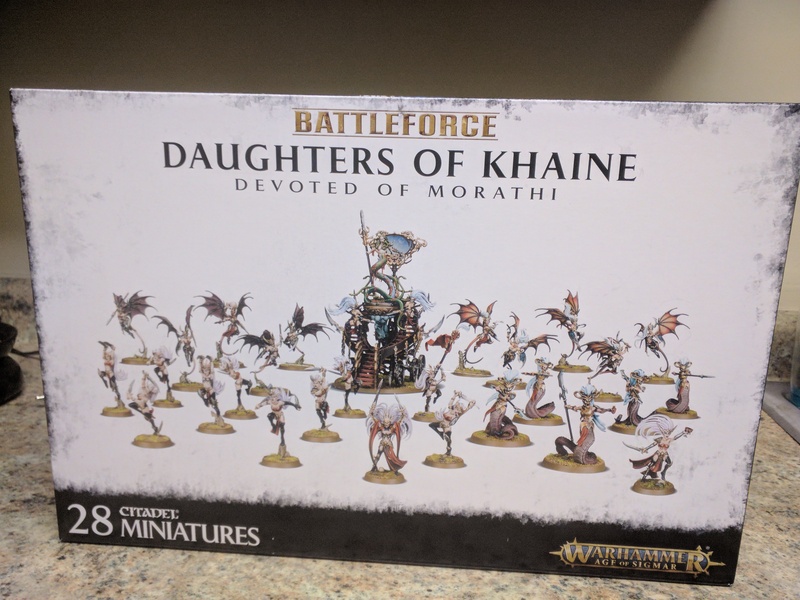 Yeah, I think Daughters of Khaine's range looks absolutely amazing. 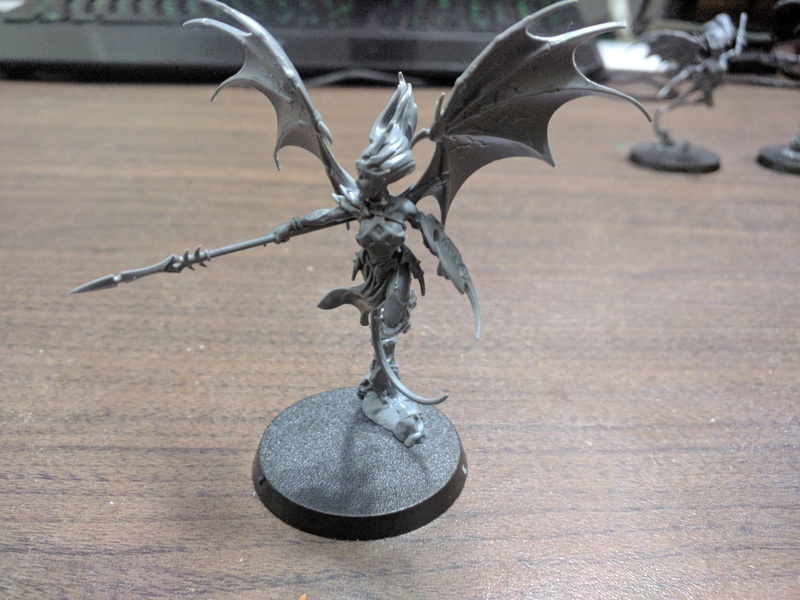 The regular Witch Aelves still look really great on their own, and the Melusai, Kheinerai, and Morathi are just out of this world. I'm also giving them a fair look, there's a lot more resources I can pull from when it comes to painting them too. Will keep your vote in mind, Dread . Sylvaneth are one of the best armies to learn dry brushing on, the army ranges from nice deep groove to tiny ones. DoK models do look amazing. 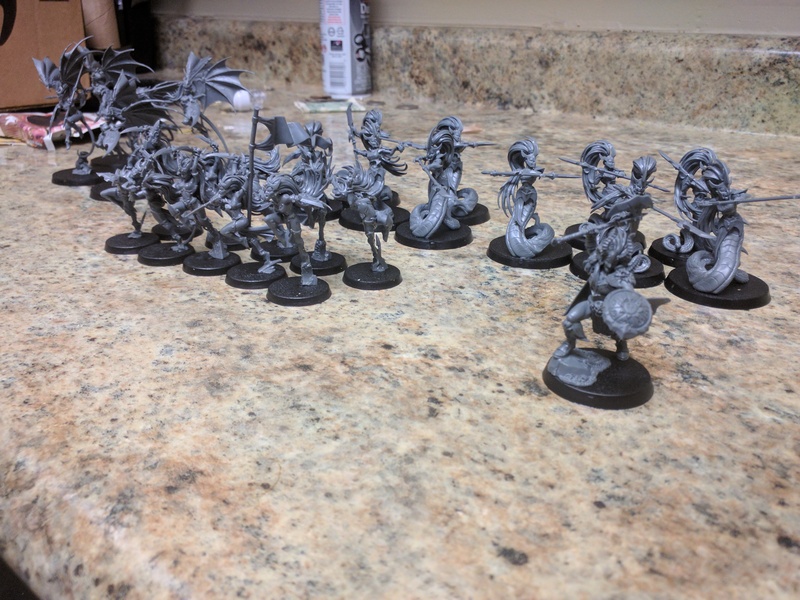 Not a bad total, paying about $25 out of my own pocket to secure one of the last Battleforce boxes I could find, I'm now three Witch Aelves boxes from reaching my first 2000 point list . Now I'm just going to have to figure out how to paint them . I've got some ideas for color schemes. This is fantastic! I'm jealous. Can't wait to see what you cook up. There are so many great colors to use, black, that will really make them stand out, red, but I'm not gonna try to talk you into any of them, black and red. I know you'll come up with, gold trim, some really great colors, white hair with red streaks. But I would never tell, pale skin tone, you what would look great. So I'm in suspense to see what you do. They look fantastic Myen'Tal. Have you assembled them as per their instructions, or is there a bit of customisation going on anywhere? Is that Blu-tack on the shoulder of this model, or is something else going on? 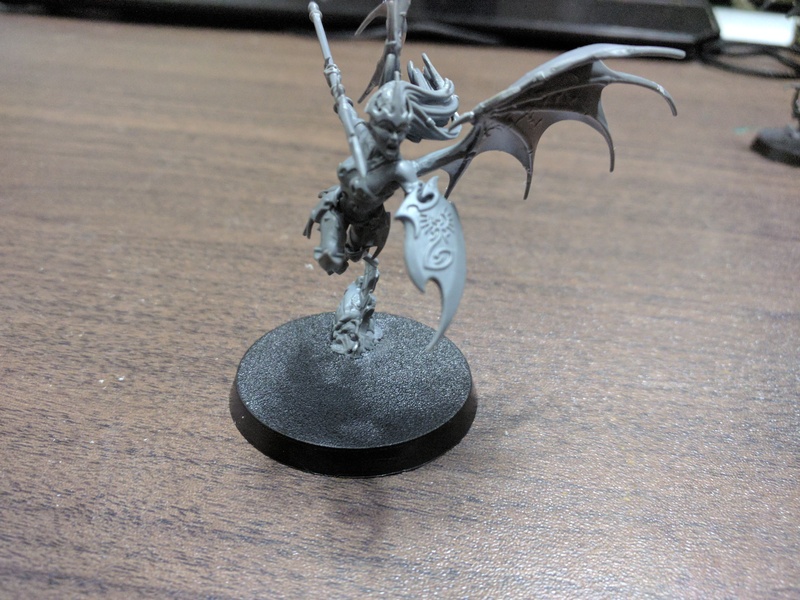 Thanks guys, the Melusai were pretty fun and easy to build. The Khinerai were too, but their wings are a bit more flimsy and ended up having to trim some of the extra length off a few of them . 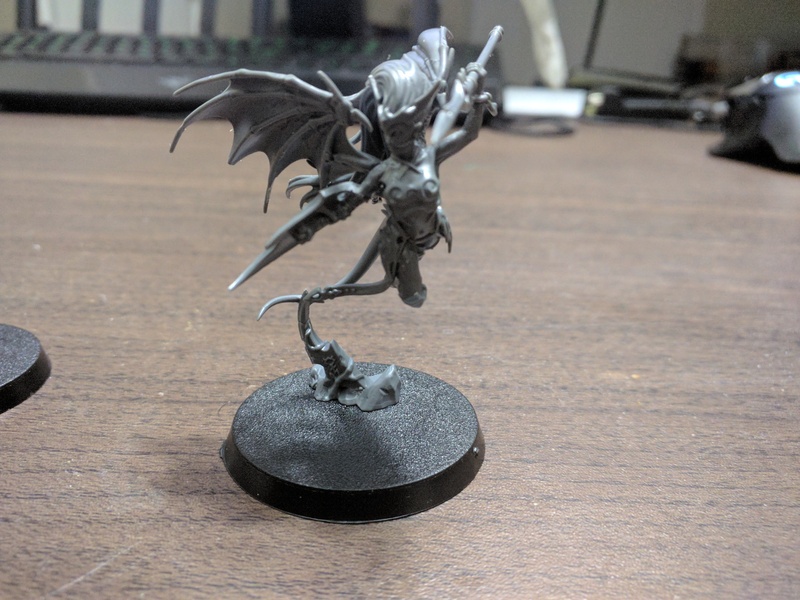 @Alienscar: A little different than the instructions suggest, I assembled them as Harpies, but just with the Lifetaker heads instead. I don't like the Harpy heads that much. 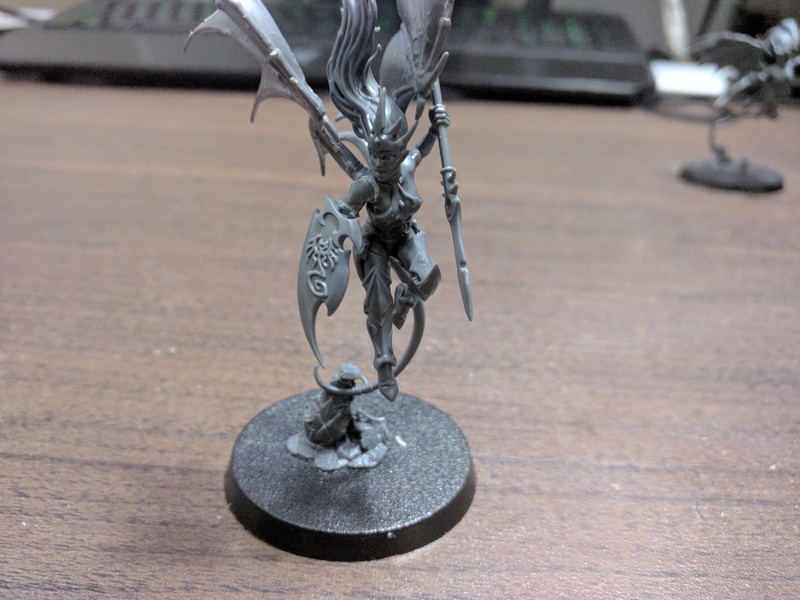 I find the Lifetaker heads that also come in the kit far more dynamic. Some of the spear posing made gluing the heads a bit tricky, but it worked out very well. Also that spot on the shoulder join isn't blue tack. It's from accidentally nudging the shoulder while the plastic cement was still drying. It doesn't look as bad as the photo suggest. Should be able to paint over that with no problem. EDIT: I also did the same thing with the Melusai kit. UPDATE: "So, Myen'Tal?" I hear you ask. "Painted miniatures, long time, no see?" A valid question. I've been kind of stuck in painting limbo for the last month, since I've set up temporarily in family's house until I figure out where to relocate to. Don't have much room to paint here, so I haven't really been doing so (even though I want to! ), and instead focusing on building more minis. I hope to rectify this situation sooner rather than later. Especially now since my airbrushes have arrived (finally!)!!! I'll have to go out of town next week to get them. Still have some hobby stuff to purchase before I can start spraying paint, however. And I'll probably need some new housing to accommodate it. "Alright, Myen'Tal, so what are your goals for your blog at the moment?" Another good question! Right now, I've been tweaking the 2000 Point goals for the three armies I have now invested in. Of course, changing the army lists will change the armies' composition. I now need more kits, but fortunately, not too many more. I'm not sure when all of this will be acquired, but I'll start plucking away sooner rather than later. Good solid start though. Also now know you're my dopelganger. All sorts of building but not much paint slinging. I'm about to get the chaos portion of the Shadowspear box, ya! Keep at it, check on you soon.